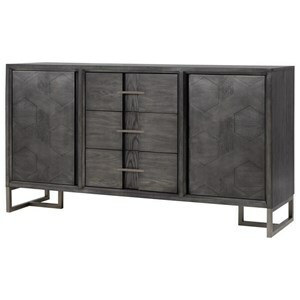 Add stylish storage to your dining room with this contemporary sideboard. Three drawers with felt lining, and a center silverware tray, alone with two doors and nine total shelves, you'll have more than enough storage for all of your silverware and serving pieces. The Documentary Contemporary 3-Drawer Sideboard with Removable Felt Drawer Bottoms by Pulaski Furniture at Reeds Furniture in the Los Angeles, Thousand Oaks, Simi Valley, Agoura Hills, Woodland Hills, California area. Product availability may vary. Contact us for the most current availability on this product. Case Construction Constructed with a rubberwood frame and quartered knotty oak veneers. Craft a subtly modern dining room with this stylish collection. Offering a variety of seating and storage options, whatever pieces you need to complete your space you'll find here. The Documentary collection is a great option if you are looking for Contemporary furniture in the Los Angeles, Thousand Oaks, Simi Valley, Agoura Hills, Woodland Hills, California area. Browse other items in the Documentary collection from Reeds Furniture in the Los Angeles, Thousand Oaks, Simi Valley, Agoura Hills, Woodland Hills, California area.